Remember how cereal snack bars (i.e. rice krispy treats) had been around forever and ever, and then suddenly cereal brands starting making prepackaged versions of them that just paled in comparison? Ugh, I’m not a fan at all! The real cereal bars, mixed in a big bowl and pressed into a baking dish, are where it’s at…always and forever. Clearly I’m a fan, if you consider that you can find Lucky Charms Treats, CerealSnack Bars, Scotcheroos, and Golden Grahams Smores Bars all within the archives of The Sweets Life! You can now add Monster Cereal Bars to that list, as that was obviously where my mind went when faced with a few boxes of General MillsMonster Cereal. You can obviously use whatever combination of monster cereals that you’d like for this—I opted to mix the Fruity Yummy Mummy and the Franken Berry for fruity, colorful bars, but these would be equally good with Count Chocula cereal as well! 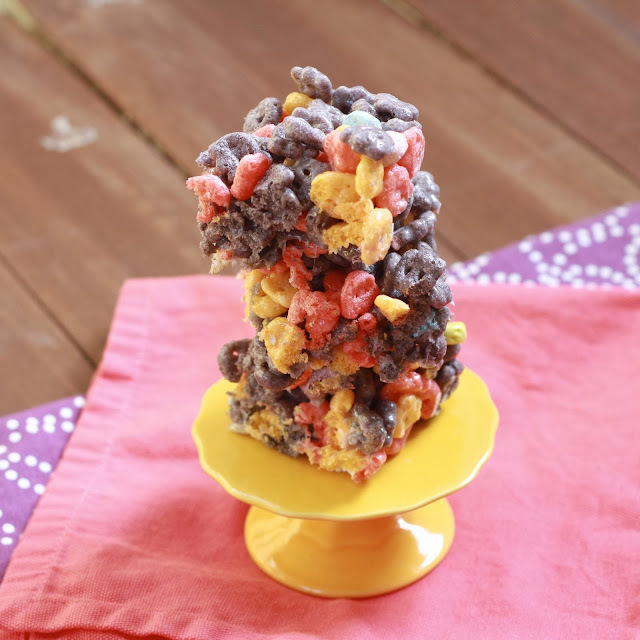 Halloween treats don’t get much easier or more classic than these 10-minute monster cereal snack bars! Disclosure: The product, giveaway samples and information have been provided by General Mills. All opinions are my own. 1. In a large saucepan, melt butter over low heat. Add marshmallows and stir until melted. Remove from heat. 2. Add cereal to the marshmallow mixture and stir to evenly coat. Press mixture into a greased 9 x 13 pan and lightly press down so that mixture holds together. Allow to cool completely before cutting into squares and serving.